One consistent finding for the last four years has been that buyers 36 years and younger (Millennials/Gen Yers) is the largest share of home buyers at 34 percent. 46 percent of buyers 36 years and younger that had debt reported having student loan debt with a median loan balance of $25,000. While only 27 percent of buyers 37 to 51 have student loan debt, they have the highest median balance of debt at $30,000. Buyers 52 to 61 are more likely to buy a multi-generational home. Buyers 62 to 70 typically move the longest distance at a median of 25 miles and are least likely to make compromises on their home purchase. 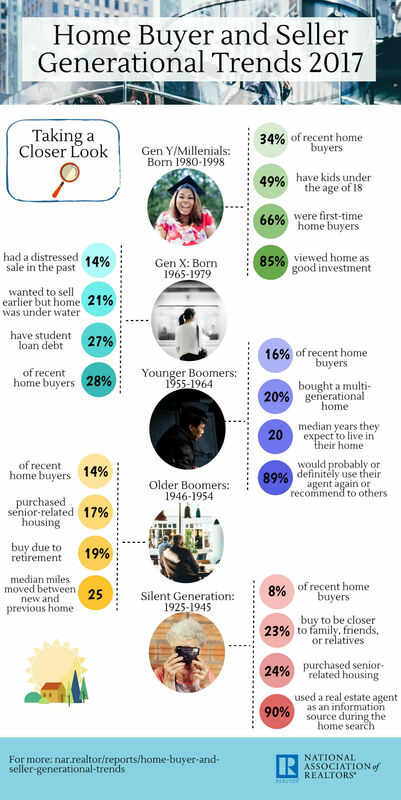 All generations of buyers continue to consult a real estate agent or broker to help them buy and sell their home.